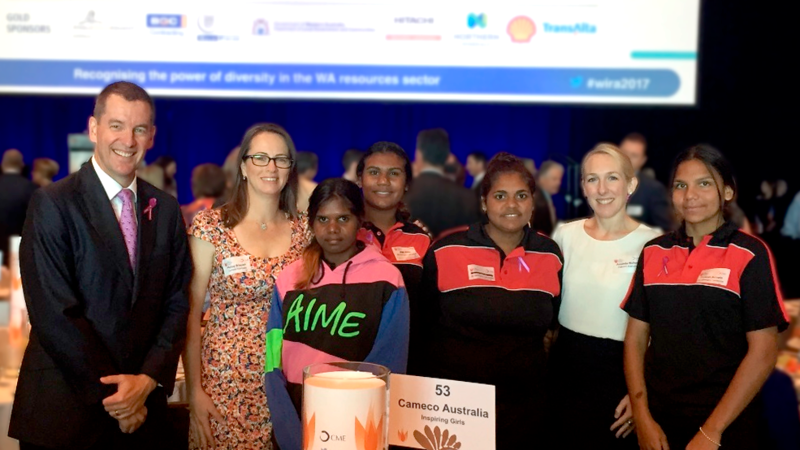 Cameco Australia was proud to support four female Aboriginal students from remote Western Australian communities learn about careers in the resources sector. Cameco Australia was proud to support four female Aboriginal students from remote Western Australian communities learn about careers in the resources sector. The students attended the Women in Resources Awards breakfast as part of International Women’s Day celebrations in Perth and afterwards took part in a ‘speed careering’ session, meeting and hearing from women who work in a diverse range of roles across the mining, oil and gas sectors in Western Australia. Cameco Australia’s Principal Geologist Penny Sinclair was one of the professional women who shared her insights and career advice with more than 70 female students at the careers forum, drawing on her experience as a geologist working in remote locations both in Australia and overseas to inspire the girls to consider a career in the mining industry. Cameco sponsored the students to attend the breakfast and careers forum through our partnership with Murlpirrmarra Connection. Murlpirrmarra is active in communities near Cameco’s Yeelirrie project, implementing a range of programs to assist young men and women achieve enhanced education and employment outcomes. Cameco’s partnership with Murlpirrmarra is entering its fourth year and we were pleased to be able to provide this opportunity for the students to dream big for their futures and think about what a job in the mining industry might be like.